Calvary Mennonite Fellowship, East Earl, Pennsylvania, USA is an outgrowth of the Blue Ball Mennonite Church. It is part of the Mid-Atlantic Mennonite Fellowship (MAMF). The Blue Ball congregation, which began in 1986, was filled to capacity by the late 1990s. Twenty-three acres of land were purchased in Brecknock Township in June 2000, with a goal to eventually build a new meetinghouse. The land was in an agricultural zone and the long process of obtaining zoning approval for a church was begun. Five years later, in June 2005, a members meeting was held at the Blue Ball church to discuss forming a new congregation. Several options were considered and a committee was appointed to find a suitable place for a new group to meet. The Fivepointville Fire Hall was chosen, and the first service was held in the fire hall on 3 September 2006. Fifty-six charter members officially established the Calvary Mennonite Fellowship by transferring from the Blue Ball congregation on 6 January 2007. Early leadership included Glenn Martin, Ray Weaver and Elmer Zimmerman. In anticipation of a new church, Glenn had been ordained minister on 18 December 2005, while still a part of Blue Ball. Ray Weaver, bishop at Blue Ball and one of the charter members of Calvary, gave bishop oversight. Elmer Zimmerman, deacon at Blue Ball, gave deacon assistance until Paul Stoltzfus was ordained as deacon for Calvary on 27 June 2007. The ministerial team was completed on 22 June 2008, when Matt Landis was ordained as minister to assist Glenn Martin. The Fivepointville Fire Hall was home to Calvary Fellowship for nearly five years. At times when the fire hall was unavailable, services were held at Hinkletown Mennonite School or Shalom Mennonite School. Sunday evening services were held jointly with Blue Ball and mid-week services on an alternate basis. During these years at Fivepointville, the building committee continued to patiently work through the zoning and permit process. Permits were finally obtained and groundbreaking for the new church building was held 7 September 2010. Construction continued throughout the winter and the building was completed in June 2011. The Calvary congregation had their first worship service in the new building on 12 June 2011, with an attendance of 129. A dedication service was held 25 September 2011. In 2012, Calvary began having regular Sunday evening services separate from Blue Ball. Also, the first Summer Bible School was held in June 2012. Jay Paul Weaver was ordained on 10 June 2012 to replace Glenn Martin. In 2013, the ministry team included Ray Weaver, bishop; Matt Landis, minister; Jay Paul Weaver, minister, and Paul Stoltzfus, deacon. As of 1 January 2013, membership was 84. Stauffer, Romaine, ed. Mid-Atlantic Mennonite Fellowship 1972-2013. Myerstown, Pa.: Little Mountain Printing, 2014. Stauffer, Romaine. "Calvary Mennonite Fellowship (East Earl, Pennsylvania, USA)." Global Anabaptist Mennonite Encyclopedia Online. April 2014. Web. 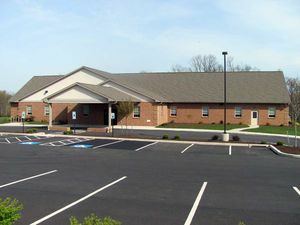 20 Apr 2019. http://gameo.org/index.php?title=Calvary_Mennonite_Fellowship_(East_Earl,_Pennsylvania,_USA)&oldid=121384. Stauffer, Romaine. (April 2014). Calvary Mennonite Fellowship (East Earl, Pennsylvania, USA). Global Anabaptist Mennonite Encyclopedia Online. Retrieved 20 April 2019, from http://gameo.org/index.php?title=Calvary_Mennonite_Fellowship_(East_Earl,_Pennsylvania,_USA)&oldid=121384. This page was last modified on 15 April 2014, at 15:23.